Logitech G25, G27, and Driving Force GT Sim-steering wheels. Pay with Visa/MC = $30 each plus $12 shipping/handling! What Are Brass Optical Encoders? Our brass optical encoders are sold as “replacement” equipment for cracked, broken, or warped plastic original equipment. In fact, many customers are purchasing our encoder BEFORE their plastic encoder fails. 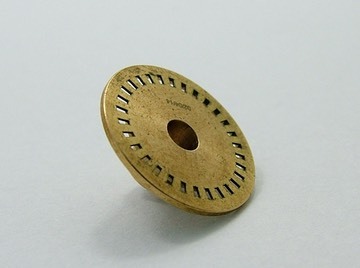 Brass Encoders are milled from solid brass rod by a mechanical engineer and then laser cut to exacting standards. They are guaranteed to last a lifetime. What Equipment Do They Fit? The two are NOT interchangeable. Please make sure you know which one you have before you order. 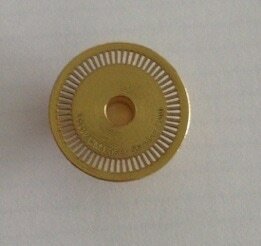 Brass Encoders are sold as a “do it yourself” project meant to replace the original plastic equipment. Using our Brass Optical Encoder to replace the original plastic equipment guarantees your wheel won't ever fail due to faulty encoder. It is not hard, but it does take some “handy” skills, and patience. I guarantee that your encoder will work, if you install it correctly and properly. What About My Logitech Warranty? Brass Encoders should only be installed on equipment that has outlived its original factory warranty. We do NOT recommend opening your wheel if it is still under warranty. If your wheel is still under warranty, please contact Logitech for service. Some People Complained It Didn't Fit. Why? Eighty percent of customers find their encoders fit just out of the box. However, the spindles on the FFB motors are NOT all the same size. Therefore, the encoder you purchase may not fit perfectly on the first try. You may need to do some adjustment. I know this after four years and many hundreds of satisfied customers. 1. If it is too tight, use a little high-grit sandpaper on a toothpick to gently remove a little bit of metal inside the encoder, and try to fit it on. It must be a tight fit, but shouldn’t require a jack-hammer to get it on. Gentle push with your finger should do the trick. Patience, Grasshopper, patience! 2. If it is a little loose, you’ll need to get some “Loc-tite” glue from your local autoparts store. This glue is designed to be used in high heat environments like automobile engines. This is less than 1% of cases. Copyright CMLaser Services 2013-2018 All rights reserved. ​Disclaimer: G25, G27 Driving Force GT are all trademarks/service marks of Logitech Co. Inc. Brass Optical Encoders are NOT made by, nor endorsed by Logitech Co.
​Visa/MC fees are higher than Paypal, so these increased fees are added to the normal price. Sorry.